It's been beautiful here today. The critters know the seasons are changing. Last night before we went to bed, we saw two young deer in the front yard drinking from the birdbath. At one point when I looked out the front window, there were a dozen cardinals in the rose of Sharon bush in the yard. We feed birds all summer, but we put out even more seed in the fall and winter. This afternoon I watched my college team play a tough game against Texas A&M. The final was 41-23 but the game was very close until the end. After the seconds had ticked off the scoreboard, I felt as if I'd played on the line during the entire game. It will be an early bedtime tonight. Prettiest bird in North America! Watching football can tire a man out. Congrats on the hard-fought win! Glad to hear your team one. That truly is a handsome bird. Sounds like an exhausting day for you. What a beautiful bird. 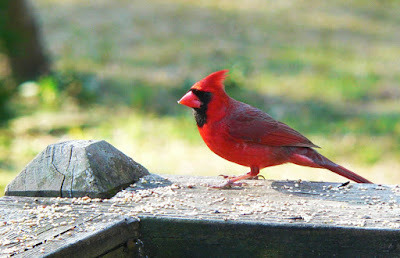 I haven't seen a cardinal since I left Illinois more than five years ago. I'm glad you had a rewarding day by having your favourite team win and having those beautiful Cardinals visit your place. We have those Cardinals here also. A beautiful song bird and what a great shot. Birds sure come in pretty colors!! Rick - you guys have got to plan a trip to Ennis if you like to trout fish. It really does have some of the nation's best fishing and the whole town of Ennis is set up for sportsmen. Jim is not much of a trout fisherman - he likes walleye and bass. But he agrees that catching trout is a whole lot of fun. We saw tons of fisherman on the river. But no red cardinals. Love those birds.